Sunbonnets & Cushions – Hello Korea ! 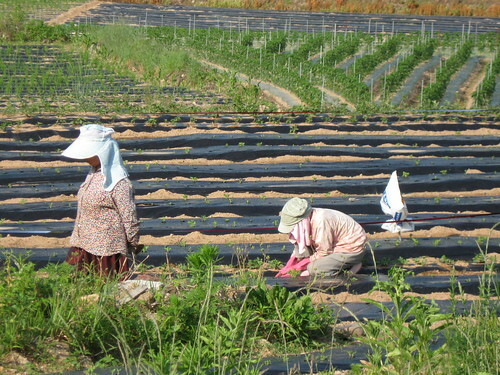 The farming women often wear towels tied around their visors for added protection from the sun, as well as tie cushions around their hips for sitting upon when they are doing intensive weeding. They all wear these baggy pants for ease of movement, and rubber gloves and arm protectors: I don’t know how they can harvest and weed with the reduced mobility wearing those thick gloves! It’s back-breaking work and I can’t imagine the heat and humidity during the summer months. So many of the old women here are bent at almost 90 degrees when standing upright, probably due to a lifetime spent bending over the fields. I love your photos. Maybe the next time I go to Korea, I will be able to visit more without too much emotions, if there is a next time. I would love to visit the countryside. Being bent for work was kind of a natural position for women. 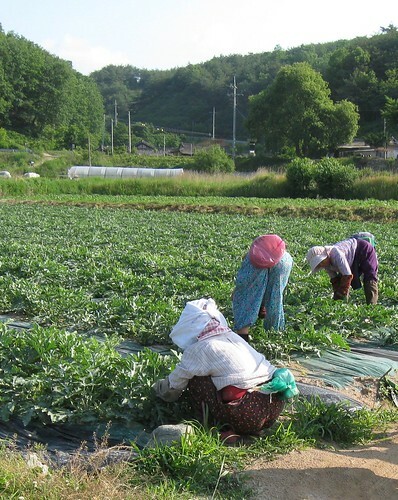 Women were always bent or in a squatting position, to make kimchi, to do laundry, to cook… Probably more natural for the women of the countryside working in the fields, and then to fuel the fire while the rice was cooking. Both my sisters and the lady with whom I stayed, were never using their kitchen counter, they were working directly on the floor or on their traditional folding table. I found it funny to see them in such position, instead of using their western style kitchen, particularly my older sister and the lady who had a huge counter kitchen. I found it funny that it modernized so rapidly that lot old people (including many of our ages and younger), don’t use their modern equipment. They prefer to sit on the floor and use the traditional table than using their western style table. Another example, my older sister and her husband sleep on the floor when they have two beds in their houses. It is something that I’ve talked often when people asked me about Korea. Korea could have become modernized in it’s own way instead, like making it’s own version of modern kitchen, or it’s own version of bed. instead of following the western version. Some days, that song “Turning Japanese” comes into my head, only I’m replacing Japanese with Korean. I find I’m hating my dinette table and wishing I had a folding table for the floor. (They even have computer desks for the floor, with the keyboard drawers and everything) I’d never want to give up the modern kitchen, even though I don’t cook much, but there is not enough counter space and the whole floor would make much more sense. Especially after seeing how the hanoaks are organized, I wonder why anyone would change to modern. The teachers laughed when they saw me taking a photo of the shelves at the end of the rooms. I couldn’t figure out if they were cots or what they were, and then I was told they were shelves for bedding and tables. I asked if that was traditional, and was told it was. But then it all made sense and I appreciated that for those who couldn’t afford expensive cabinetry, these shelves would make a larger living space possible. I have this ridiculously huge bed that takes up half of my living space. I want to chop it up and burn it, but it belongs to the school. If I renew my contract, I am going to ask that it be taken away and then I will buy a Korean futon and coverlet. It just makes more sense, and they are very comfortable. Young-a said there was an American architect expat who was protesting the slated destruction of hanoaks in Seoul. He said he moved to Korea mostly because he wanted to live in a hanoak. I wish I knew who he was, so I could go join him in front of the bulldozers and marry him. This weekend, the Su-jol-dang residence where we stayed in Andong will be featured on t.v. I wish Koreans society could recognize the value of their own culture more (without getting all nationalistic about it) and at the same time learn that maybe being considerate is more important that mandated respect levels, and that all human beings are equal, no matter what their status or gender. I think society is changing in this way, but not fast enough. But the culture? I am afraid we are the last ones who will see any of this stuff. I think it will pass away with the adjummas and adjoshis. In 20 years, it will only exist in museums.